In another blow to Ukraine’s struggling space sector, Iridium Communications has postponed plans to launch two Iridium Next satellites aboard a Dnepr launcher. Instead, Iridium will move up a scheduled launch of spacecraft aboard SpaceX’s Falcon 9. Space News reports the launch had been scheduled for April. However, the Russian Ministry of Defense has not yet issued the required licenses to launch the booster from Yasny spaceport. 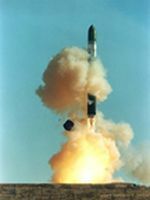 Dnepr is a joint program between Ukraine and Russia under which decommissioned ballistic missiles are converted into satellite launches. Russia has been looking to phase out use of the booster in favor of domestic launchers amid political tensions with Ukraine. The International Monetary Fund has estimated that Ukraine’s space sector has lost up to 80 percent of its revenues as a result of canceled orders from Russia. The first two Iridium Next spacecraft were to be launched aboard Dnepr so engineers could verify their design and operations. The company plans to launch 72 Iridium Next spacecraft by the end of 2017. Iridium now plans to launch the first 10 satellites aboard a SpaceX Falcon 9 rocket whose flight has been moved up to July from August. A second Falcon 9 would launch an additional 10 spacecraft in October. The Dnepr launcher could be used later in the Iridium Next deployment sequence if the required licenses are obtained. Love the irony of the headline … The Dnepr is delayed, and a Falcon flight moved up? The World Turned Upside Down.